CUPERTINO (California): Apple Inc's newest iPhone left Wall Street and fans wishing for more than a souped-up version of last year's device, igniting a rare storm of criticism and disappointment on the Internet. Newly minted CEO Tim Cook ably helmed his first major product launch without former boss Steve Jobs, but failed to ignite the sort of excitement and buzz that the charismatic Apple co-founder once did. Expectations were high at this critical juncture, when Android phones by Samsung Electronics and other rivals are closing in on Apple's lead and the important holiday shopping season gets started. Investors and fans, looking to be blown away by some amazing surprise, sent the shares down as much as 5% before they recovered with the market to close down 0.6%. Cook, who took over from Jobs in August, and his executive team showed off a device that comes with voice recognition and a better camera, but looks identical to the last phone and does little to lift the bar for smartphones. While the gadget wasn't as tricked out as some had hoped, analysts liked its voice-enabling technology that helps users vocalise everything from stock price searches to sending messages - more easily than on Android phones or Research in Motion's (RIM) Blackberries. "It's been 16 months and all you've got is an A5 processor in the existing iPhone 4," said BGC Partners' analyst Colin Gillis. "It's a mild disappointment, but they're still going to be selling millions of units." Some shareholders and analysts hoped for a cameo appearance by Jobs, now chairman. The pancreatic cancer survivor, who took his third medical leave in August, did not appear. In some ways, Apple may have been a victim of its past success. Its launches are some of the hottest events on the tech calendar. Tuesday's "Let's talk iPhone" show marked Cook's unofficial debut since taking over from Jobs in August. Analysts say it is more crucial than ever to sustain the popularity of its aging iPhone 4. Apple sold more than 20 million units in the third quarter ended June 25. "It's kind of funny - if they have gone and called it the 5, the stock would have been fine, but they're calling it the 4S, which is a disappointment to some," said WP Stewart portfolio manager Michael Walker. The iPhone, which accounts for more than 40% of Apple's sales, has been a success since it came out in 2007, making Apple into one of the world's leading consumer electronics companies. On a brighter note, the company would seem to be making inroads into potentially pivotal new markets. It said more than 90% of Fortune 500 companies are testing or using its iPhones and iPads, expanding its presence in a corporate market dominated by RIM. RIM shares trading on the Nasdaq stock market slid nearly 3% before ending 2.4% higher. Google shares finished 1.3% up. The two-generation-old iPhone 3GS will be offered free, as long as users sign a contract. Analysts said that would help to expand its market in lower-end Asian and developing markets. "Apple is hitting Nokia when it's vulnerable. How many billions of people in emerging markets would love to have an iPhone? These are a growing demographic," said YCMNet Advisors CEO Michael Yoshikami. Tuesday's iPhone event took place at Apple Central - the same venue where the iPod first was introduced years ago - versus the larger, splashier venues of more recent choice such as downtown San Francisco's Moscone centre. Heading in to the event, many on Wall Street had questioned Cook's ability lead the company as Jobs did. In terms of stage presence, Jobs was a tough act to follow, but analysts say Cook acquitted himself well. Twitter users were not impressed with the phone, though. "Please note I will be selling some 'S' stickers for $0.99 so iPhone 4 owners have a cheaper upgrade option," wrote HAL9000 on Twitter. Tomlinsonr tweeted, "I'll have a double helping of 'meh' with a side of 'whatever'." 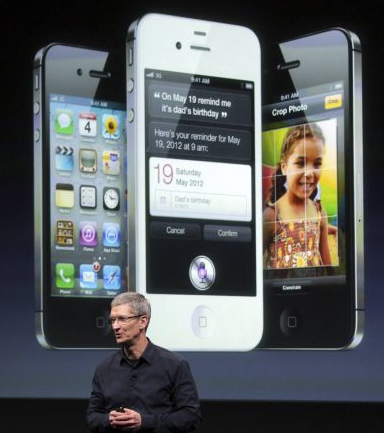 The latest version of the iPhone comes as the economy slows and competition intensifies. People activate more than 550,000 Android-based devices - including Tablets - each day. Nielsen data shows the iPhone was No. 2 in the United States with a 28% market share, with Android at 43%. Globally, iPhone shipments rose 9.1% in the second quarter while Nokia's plummeted more than 30%, handing the top spot to Apple with a market share of 18.4%, according to IHS iSuppli. Samsung, whose shipments grew faster, is coming on strong with a market share of 17.8%. Despite disappointment online, analysts said the phone is superior to many rival offerings.